While killing time before Sen. Dianne Feinstein‘s press conference to introduce her new assault weapons ban, CNN’s Ashleigh Banfield focused on what she called the “theatrics” of the event, specifically the display of assault weapons that was set up for the occasion. 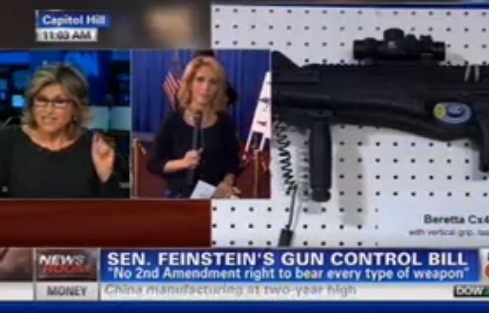 Banfield noted that, unlike Meet The Press‘ David Gregory, Sen. Feinstein had secured permission to display the weapons, which violate Washington, DC gun laws, but also promoted the false notion that objections to assault weapons have to do with the way the guns look, rather than the way they function. Bash didn’t address the “problem” of “theatrics,” instead describing the assault weapons display, and noted that “they got special permission from the DC police, and also from the Capitol Police, and there are a lot of Capitol Police officers here,” she replied. Again, Bash ignored the premise of the first question, and responded to the second, explaining some of the provisions of the bill, but aside from the extended magazines, failed to explain how any of the features of these weapons relate to function, rather than form. That’s when the press conference started, leaving viewers with the impression that some say these guns just look scary, and some other people say the “issue is meritorious,” and how can we possibly know the truth? Using these criteria, the BATF classified forty-three weapons as assault weapons. In so doing, it established a non-arbitrary method for distinguishing assault weapons from other semiautomatic weapons. Unlike the current system, which forces legislators to prove that a particular weapon is especially threatening, under this new approach possession of certain semiautomatic weapons would be treated as a “privilege,” not as a “right.”  There is precedent for such a system: the current New Jersey law, for example, exempts assault weapons that the Attorney General determines “[are] used for legitimate target shooting purposes.”  Licenses should be granted only for those weapons that are particularly suited to hunting or some other valid purpose, and only to individuals who have passed a background check. This would allow “honest citizens” the privilege of owning a hunting weapon, and possibly, a licensed handgun for self-defense. A good part of that beginning would be for journalists to tell the truth about assault weapons, rather than repeating NRA lies.